I often hear people say that a person suffering from Alzheimer’s is not the person they knew. I wonder to myself – Who are they then? The unraveling of a life in the mind of a person with Alzheimer’s disease has been described as “the great unlearning,” the “demise of consciousness.” Just what does the disease uncover about the nature of being human? What’s left when memory dissolves “into thin air?” What role does the disease play in our fears of growing older and ageism? To hear an engrossing and enlightened discussion on these issues listen to Krista Tippett, host of on Being for National Public Radio (click below to listen): Alzheimer’s Memory and Being. National Institute on Aging; Home Safety and Alzheimer’s Disease that I’m reprinting here and crediting them with the content. Please visit their website for further help. Over time, people with Alzheimer’s disease become less able to manage around the house. For example, they may forget to turn off the oven or the water, how to use the phone during an emergency, which things around the house are dangerous, and where things are in their own home. As a caregiver, you can do many things to make the person’s home a safer place. Think prevention—help avoid accidents by controlling possible problems. While some Alzheimer’s behaviors can be managed medically, many, such as wandering and agitation, cannot. It is more effective to change the person’s surroundings—for example, to remove dangerous items—than to try to change behaviors. Changing the home environment can give the person more freedom to move around independently and safely. You can buy home safety products at stores carrying hardware, electronics, medical supplies, and children’s items. Simple the home Too much furniture can make it hard to move around freely. Have a sturdy handrail on stairways. Put carpet on stairs or mark the edges of steps with brightly colored tape so the person can see them more easily. Remove small throw rugs. Use rugs with nonskid backing instead. Make sure cords to electrical outlets are out of the way or tacked to baseboards. Make sure the person with Alzheimer’s has good floor traction for walking. To make floors less slippery, leave floors unpolished or install nonskid strips. Shoes and slippers with good traction also help the person move around safely. People with Alzheimer’s disease may not see, smell, touch, hear, and/ or taste things as they used to. You can do things around the house to make life safer and easier for the person. Although there may be nothing physically wrong with their eyes, people with Alzheimer’s may no longer be able to interpret accurately what they see. Their sense of perception and depth may be altered, too. These changes can cause safety concerns. Make floors and walls different colors. This creates contrast and makes it easier for the person to see. Remove curtains and rugs with busy patterns that may confuse the person. Mark the edges of steps with brightly colored tape so people can see the steps as they go up or downstairs. Use brightly colored signs or simple pictures to label the bathroom, bedroom, and kitchen. Be careful about small pets. The person with Alzheimer’s may not see the pet and trip over it. Limit the size and number of mirrors in your home and think about where to put them. Mirror images may confuse the person with Alzheimer’s disease. 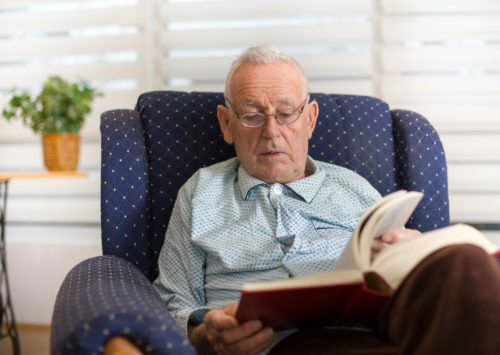 People with Alzheimer’s disease can read until the late stage of the disease. Use signs with simple written instructions to remind them of danger or show them where to go. Reset your water heater to 120°F to prevent burns. Label hot-water faucets red and cold-water faucets blue or write the words “hot” and “cold” near them. Put signs near the oven, toaster, iron, and other things that get hot. The sign could say, “Stop!” or “Don’t Touch—Very Hot!” Be sure the sign is not so close that it could catch on fire. The person with Alzheimer’s should not use appliances without supervision. Unplug appliances when not in use. Pad any sharp corners on your furniture or replace or remove furniture with sharp corners. Test the water to make sure it is a comfortable temperature before the person gets into the bath or shower. A loss of or decrease in smell is common in people with Alzheimer’s disease. Use good smoke detectors. People with Alzheimer’s may not be able to smell smoke. Check foods in your refrigerator often. Throw out any that have gone bad. People with Alzheimer’s may not taste as well as before. They also may place dangerous or inappropriate things in their mouths. Keep foods like salt, sugar, and spices away from the person if you see him or her using too much. Put away or lock up things like toothpaste, lotions, shampoos, rubbing alcohol, soap, perfume, or laundry detergent pods. They may look and smell like food to a person with Alzheimer’s disease. Keep the poison control number (1-800-222-1222) by the phone. Learn what to do if the person chokes on something. Check with your local Red Cross chapter about health or safety classes. People with Alzheimer’s disease may have normal hearing, but they may lose their ability to interpret what they hear accurately. This loss may result in confusion or overstimulation. Don’t play the TV, CD player, or radio too loudly, and don’t play them at the same time. Loud music or too many different sounds may be too much for the person with Alzheimer’s to handle. Limit the number of people who visit at any one time. If there is a party, settle the person with Alzheimer’s in an area with fewer people. Shut the windows if it’s very noisy outside. If the person wears a hearing aid, check the batteries and settings often. It may not be necessary to make all these changes; however, you may want to re-evaluate the safety of the person’s home as behavior and abilities change. For more on home safety and Alzheimer’s, read Home Safety Checklist for Alzheimer’s Disease. Is It Safe to Leave the Person with Alzheimer’s Alone? This issue needs careful evaluation and is certainly a safety concern. The following points may help you decide. Does the person with Alzheimer’s? Become confused or unpredictable under stress? Recognize a dangerous situation, for example, fire? Know how to use the telephone in an emergency? Know how to get help? Stay content within the home?